An integral part of Infinite‘s image and identity is their dance. The seven member group from Woollim Entertainment is known for their dancing skills; specifically their precision and knife-like choreography. With their recent comeback, “The Eye,” once again showcasing their teamwork and their choreography once again being central to their performance, it’s a great time to talk about Infinite. Pat: To start, what do you you enjoy about Infinite’s dancing and why? Sarah: When it comes to Infinite, everyone has to talk about their synchronicity, and I think it’s entirely well-founded. Not to be repetitive, but while other boy groups may perform synchronized dances very well, or impress in style or complexity, Infinite somehow takes the boy group dance to another level. I never get bored watching them. Take a minute to watch this special performance they did circa 2014. As a group they have such power and fluidity that it’s easy to forget there are seven individuals dancing together. There’s also something about them that’s so classic – a throwback to the choreography of the early 2000s – and they know their style so well by now that they don’t try to do crazy things just to impress fans. Though when they do do crazy things (see the Scorpion Dance), they have the hard work and experience to pull it off so cleanly and smoothly. So, I love Infinite’s dancing because I can get lost in it, every single time I watch them. Pat: I definitely agree, Sarah, that Infinite’s synchronicity is definitely a hallmark of the group. In fact, wasn’t there a Weekly Idol episode where their angles were even measured? While other groups are just as synchronized, there’s just something special about Infinite. My favorite thing about Infinite is how fluid their movements are, despite the sharpness of their moves that rely so heavily on angles and formation. Their dances always flow and their arm movements are their strong points – there’s a certain ballet-like element in their arm movements that make it so interesting to watch. And I agree that their dances are deceptively simple – the complexity is in the sharpness of the execution and the synchronization. This is even a greater achievement considering out of the seven members, only the Infinite H members and, to a certain extent, Woohyun, are natural dancers. Everyone else – and to a greater extent, Sunggyu and Sungyeol – are so awkward to look at when they dance alone. Cjontai: That’s definitely something to note about Infinite for sure. You really have to look hard to find a weak link when it comes to their dancing. They match so well that it’s uncanny. What I appreciate a lot is how the fluidity of their movements mimic the flow of the music. They are one of the only groups I know who incorporate lyrical dance into their routines. Take their recent release “The Eye,” for example. Every note is punctuated by a move. It’s quite intricate and beautiful for that reason. Sarah: Their dances really do have a lyrical ballet quality to them. The fluidity of their movements, the emphasis on angles, formations, and the sharpness and extensions of their arm movements – these are all highlights of ballet that we don’t normally see in boy group dances. From the intro of “Back” to the constant fluid movement of “Last Romeo,” even when they’re hitting the point choreography of each dance, every move flows clearly and smoothly into the next and it seems as if they never really stop moving from minute to minute. There’s no stopping to catch their breath, no preparing for the next impressive move, no staring sexily into the camera. Just pure dance. The closest they get to pausing is when they might be walking into a new formation. To me this just makes the fact that they’re always so in sync that much more impressive. It would be so easy for one of them to fall behind and not be able to catch up, and yet they never do. Pat: I think thats one of the reasons I wasn’t a fan of “Bad” – it was less arm movements and more lower body movements. 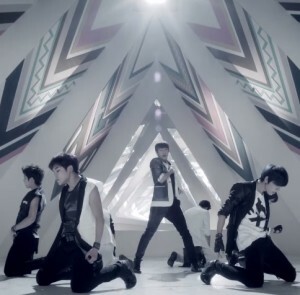 Dances like “Last Romeo,” “The Eye,” and “The Chaser” are better examples of the hallmarks of Infinite’s dancing. As you all said, they are lyrical ballet-like arm movements, angles, formation, sharpness and precision all come to mind when talking about Infinite. As for who does their choreography, it is Kim Dongmin, someone who has been working with them since their debut, I believe. That in itself is interesting – how many K-pop groups have stuck with one choreographer for the majority of their discography and with such consistency? Sarah: The fact that they’ve worked with the same choreographer for so many dances over the last six years definitely helps contribute to their teamwork and confidence. If they’re not switching up dance styles or having to learn to work with a new person each time, it gives them much more opportunity to simply perfect their choreography. And since we are all agreed that their synchronicity is their highlight, I think it’s very much due to the fact that they’ve consistently worked with one choreographer. It must have an impact as well on the fact that Infinite is one of the groups with the most consistent personal style. Now that we’ve established how much we all love Infinite’s style of dancing, what is your favorite performance of theirs? Pat: I find it really hard to pinpoint a performance of theirs that stands out because Infinite are just so consistent with their performances. I think my favorite will have to be from one of their concerts. Specifically, “Dashi Dorawa” from Second Invasion. Something about the live band and the army invasion theme gets to me. Another performance that holds a special place in my heart is their Beautiful Concert performance of “The Chaser” because 1) it’s one of the few where you can actually see the other six kneel at Sunggyu’s part in the second chorus, 2) I find that it’s one of the best shot “The Chaser” performance, and 3) this is the first video I have ever watched from Infinite. Cjontai: Something about “Back” gets me every time I watch it. I love watching them change formations so smoothly. My inner band geek gets excited when they weave in between each other. “Destiny” is another favorite because they resembled majestic birds with their arm movements. The way they hit the floor to punctuate the climaxes in that song just… There are no words for it. But the absolute top for me has to be “Without You” by Infinite H. This routine is what had me check out Infinite during my early k-pop days. Dongwoo‘s moves were so slick and clean, and Hoya knows how to get deep into the groove. I could watch that foot shuffle they do during the chorus on loop and not get sick of it. Sarah: I also first discovered Infinite during “The Chaser” promotions, so that one will always have a soft spot in my heart. Plus, I love the dramatic hand motions and leg kicks thrown into the choreography. Beyond that, I too find it incredibly difficult to choose a favorite. I love anything Infinite H puts together because, as Cjontai mentioned, both Dongwoo and Hoya are so eye-catching on stage. I will always go back to “Last Romeo” because I think it’s the dance that highlights the group’s synchronicity the best, and “Man in Love” never fails to make me smile. All of the above is why, no matter how long it’s been or how many other impressive dance groups debut, I will never get tired of watching Infinite perform. That’s it from us! What do you love about Infinite’s dancing and what are your favorite dances from the group? Tell us below! The Sunday Social, 10/2: Shinee Comeback Party Post!